It's time to start buying for 4Q, so TDmonthly Magazine asked manufacturers what they have in store for the Holiday season. Alongside more traditional toys, several companies told us about new products that were created in response to important issues facing our nation. Angela Delmedico of Little Green Money Machine told TDmonthly that the recession prompted her to create a line of products geared toward improving the financial literacy of children, tweens, and teens. "If the next generation has this savvy and confident skill set, they will be better prepared" for the working world, she said. The Little Green Money Machine Interactive Book and Storefront includes the book "Kids in Business," a business stand, and a custom banner set, so kids can really experience what it's like to be an entrepreneur. The products "teach kids in a fun, hands on way how to set up and start their own business or fundraiser," and help build skills in goal setting, perseverance, and finance, shared Delmedico. Michelle Obama, with her campaign to combat childhood obesity, isn't the only one interested in getting kids up and moving. Manhattan Toy has come out with a new line of sports-themed soft action figures for boys. The Boysterous boys each specialize in a sport, and their magnetized hands and feet make it easy for kids to manipulate them into different sports moves and stunts. These athletic figures help put the focus on how fitness can be fun. Julie Flann of Manhattan Toy told TDmonthly that, furthermore, "These Boysterous boys are unique in that their characters are not filled with violence and other material inappropriate for small boys." Not all of the toys coming out for 4Q are so serious. 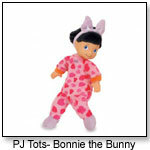 Manhattan Toy is also producing a new line called PJ Tots, which features dolls for girls aged 18mos and up. "Every doll has their very own colorful themed pajamas that match their personal sleeping bag," and feature soft, cuddly fabrics and beanbag bottoms, Flann told TDmonthly. Of course, all of the new toys a child receives during the holidays can create a huge clean-up problem for mom. That's where Neat-Oh! Toys comes in. Their unique line of ZipBin products is multipurpose: when closed, they are containers for toys, and when opened, they serve as a play environment for the toys held within. For instance, the LEGO NINJAGO Battle Case can be opened up into a battle arena. When kids are done playing, they simply zip the toys back into the case. 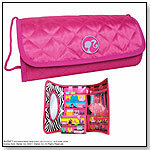 For girls, there's the Barbie ZipBin Clutch, a pink satin clutch purse that, when opened, features a Barbie dressing room on the inside. "While creating a fun environment for kids, we also aim to remove the excuse for a messy room and save parents from stepping on hidden cars in the middle of the night," Wilson Peters, regional sales & marketing manager for Neat-Oh!, told TDmonthly. If you're looking for a quirky gift, Uglydolls from Pretty Ugly LLC fit the bill. Their new doll Suddy is a bright orange plush creature who lives life in the fast lane. Each doll has its own unique personality, from "natural born leader" Dave Darinko, to the neurotic Groody. These unique gift items have seen immense popularity since their creation nearly ten years ago, and these new styles are expected to be big sellers during the holiday season. Other companies, such as Cool Jewels Wholesale Fashion Jewelry, are revamping classic items for 4Q. "Mood rings have been around for ages, but many retailers aren’t aware that the mood craze has extended well beyond the rings," Marc St. Pierre, director of sales at Cool Jewels, told TDmonthly. Mood pendants in shapes such as flowers, yin yang, and the classic best friends heart halves are expected to be big sellers this holiday season. St. Pierre sites the affordability and interactive nature of the mood pendants as what sets it apart from other children's jewelry. "We’re appealing to kids between the ages of 5 and 12. It’s the cool interactive nature of these pendants- kids touch them to see what color they can make them change to, which reveals their 'inner mood.'" People may think of jewelry as a gift to give girls, but the wide assortment offered by Cool Jewels appeals to all genders. The Fantasy Ball Claw Necklace has remained a best-seller for boys, along with the glow-in-the-dark Scorpion Leather Bracelet. "What sets us apart is the massive variety which we offer...From venue specific such as NASA logo, Dinosaurs, Space Needle, etc, to hip and cool styles such as guitars, yin-yangs, and dragons – there is literally something for everybody," St. Pierre told TDmonthly. Developed by Del Visionaries, the Little Green Money Machine is a gateway learning system designed to teach children lifelong skills, in addition to building confidence and self esteem. 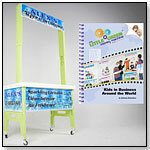 The book and storefront stand can be used at home, in the classroom, and with youth groups and fundraising projects. This system teaches children about money management and business, and lays the foundation to learn about entrepreneurship. The interactive book, "The Little Green Money Machine: Kids in Business Around the World," offers content, ideas and exercises to give children ages 7 to 14 the tools and know-how to run a business, set goals, and pursue their dreams. The storefront is an all-purpose business stand where children can set up actual business ventures and fundraisers and apply what they have learned in the book. It includes adjustable-height upright posts, five magnetic and dry erase banner areas for marketing and increased visibility, built-in cupholders, a built-in money tray with lock and key, a solar-powered calculator, and a storage area for marketing materials, such as brochures, fliers and business cards. Each action packed figure comes with their own sports equipment: hockey puck and stick, skateboard, snowboard, soccer ball and football. Magnetized feet and hands allow each action figure to grab their gear. The line features 5 different action figures: Slap Shot Sam, Touchdown Dylan, Shredding Sean, Goalie Gavin, and Half Pipe Pete. Launch date: March 2011. Each little tot is small enough for young children to play with and feature a molded face and beanbag bottom. Every doll has their very own colorful themed pajamas that match their personal sleeping bag (sold separately.) Launch date: January 2011. This battle case doubles as both a storage case for the Ninjago masters to be stored in as well as the supreme battle arena. When it’s time to fight, chose between fire and ice for your showdown. Featuring colorful artwork, the case can be used to store Ninjago figures, spinners, weapons and cards all away neatly. Portable; LEGO Bricks not included. This beautiful Barbie ZipBin®Clutch is a girly accessory for any outfit. With Barbie-pink woven designs on the front dressing room on the inside, the Barbie ZipBin Clutch lets every girl make a statement. Launch date: June 1st, 2011. The ZipBin Doll House Playpack from Neat-Oh! Toys is a toy box, a backpack and a dollhouse all in one. Decorated inside and out to stimulate imaginative play, the ZipBin Doll House Playpack is a cute play house for all sorts of dolls, and even includes one doll to start playtime. Best of all, when kids are done playing, they can store and carry their toys in the ZipBin Doll House Playpack. Measures 9"L x 3.5"W x 15"H. Serves as back pack and dollhouse combo to take-along for play on the go includes a small doll. This fantasy ball claw necklace remains popular with the boys. Each pendant hangs on an adjustable slider cord necklace. Each ying yang pendant hands on an adjustable black slider cord. Each pendant has blue and pink designs within the ying yang. Other styles within this line include butterflies, bear paws, stars, and more. This heart necklace reads “Best Friends” and is split into two pendants, each with their own 18” diamond cut ball chain. These pendants are made with mood material, which change colors when touched or worn to reveal your inner mood. Each set of two necklaces comes on a mood header tag that define the meanings of each color that the pendant turns into. Suddy is a very busy girl with a lot going on. She’s got no time for slow pokes and doesn’t want to wait around for laggards. If you want to keep up with her, you’ll have to live life in the fast lane. That means waking up in the morning and going to bed having lived your life to the fullest! But what does that mean? It means she loves you and also candy. Uglydoll Suddy is approx. 12" tall. — Dean Smith, Co-owner of JaZams in Princeton, N.J. told TDmonthly in a Summer 2011 survey that as far as action figures go, "We don't sell a lot of those." Plush Uglydolls are as close as they come, and JaZams sells 15-18 each month. — Powell Phillips, owner of Phillip's Toy Mart in Nashville, Tenn., and Kim Emigh, manager of e-commerce at Growing Tree Toys in State College, Pa., both told TDmonthly in an October 2011 survey that Ugly Dolls were their best-selling tween item, though they both said that tweens are not a big presence in their store. Dave Darinko is a natural born leader. He’s the one you want on your side when you’re about to face the music. And when you do face the music, he’s the guy who knows where the volume knob is. Does that make sense? Anyway, Dave gives you the thumbs up. He knows that you know he knows you know. 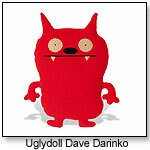 Uglydoll Dave Darinko is approximately 12" tall. 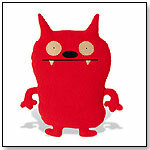 — Two out of 15 retailers surveyed in late Spring 2011 said that Uglydolls were their best-selling plush. Groody is a pretty relaxed, easy going, energetic, stressed out, moody broody mess. AAAAHHHH! Did I just close that door? It was a ghost! Did I close the garage door? Did I send that e-mail to the wrong person!!!??? You get the picture…which is exactly why Groody has chosen you to be his pal. If you are willing to help him on his quest for inner peace he will help you on your quest for whatever dealio you got going. 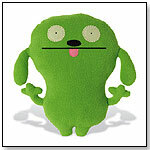 Uglydoll Groody is approximately 12" tall.